Mr. Holm / Danielle – Guilty of Contempt?? – Kent Hovind v. Robert Baty – The Great Debates! Home→Mr. Holm / Danielle – Guilty of Contempt?? 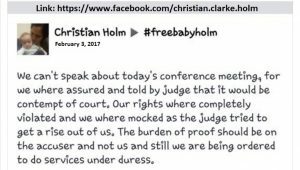 The above screen shot was circulated today, February 3, 2017, appearing to be a timely report from Mr. Holm or Danielle regarding the results of their status hearing in the custody case involving their baby. The State of Alabama took custody of the child shortly after the birth, based upon reasonable cause that the two transient parents were not prepared to properly care for the child. Mr. Holm and Danielle, the parents, have been doing just about everything they can since that time to insure the child will not be returned while promoting anti-government, sovereign citizen notions and, among other things, circulating a still secret 25 page letter and filing a frivolous federal lawsuit. Further details are available on this website and in the FaceBook group entitled “Understanding The Baby Holm Case”. 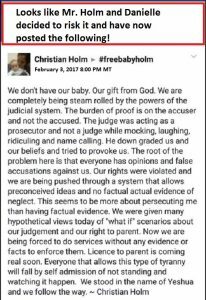 If the above message was posted as indicated, it appears to have been quickly removed as there have now been numerous reports that no one can find it on Mr. Holm’s FaceBook page on in his “#freebabyholm” FaceBook group. If it is not a legitimate reflection of a post that was made, “we” have been hoaxed. If it is a legitimate reflection of a post that was made, it’s removal may be a reflection of Mr. Holm’s and/or Danielle’s “consciousness of guilt” regarding possible contempt of court. Maybe we will hear more of this matter.